That evening, Pia kindly replaced me as the guardian, since I had to leave early. She sent me the following log, with her comments. The title is also hers. Maxine, Pema and Adams already sat in front of teahouse when I arrived. They are in good mood and talk about weather in RL and SL. Pia Iger: here in SL or RL? Pema Pera: Yes, though we can make it rain if we want — at least Storm can ! Pema Pera: he can move mountains! Pia Iger: I have not experienced the rain in SL yet. Pema Pera: ask Storm next time you meet him Pia! Pema Pera: and with thunder thrown in if you like! Pia Iger: Ok. Will do. Love in the rain, but not feel getting soaked. Pema Pera: and he can even whip up a storm! I can’t help bugging Maxine again about her dream exploration. But conversation turned to the short history of PaB. Pia Iger: Maxine, would you like to talk a bit about dreams? Maxine Walden: oh, yes, April fools…so interesting it seems soo long ago..
Pia Iger: I was not born yet that time. Pema Pera: how time flies, Adams! Maxine Walden: oh, lovely, Adams, does it seem like a long or short time? Pia Iger: Adams is already grown up in 2 wks! Pema Pera: can work too! Fred walked over bridge and join us . Friedrich Ochsenhorn: a baker’s half dozen? We are reminded of Faenik, the Fael’s cat, whom Maxine has not much clue of yet. Maxine Walden: hehe, yes, ‘why not’? Maxine Walden: never have seen Faenik; is he/she a figment of our imagination? Maxine Walden: a voice without a body? Friedrich Ochsenhorn: a cheshire cat? Pia Iger: ok. Run, Pema! Adams Rubble: How did that happen? Pema Pera: see y’all ! Pema Pera: who of you can catch it, for the next half hour or so? Pema left and did not make his return in this session. Fred shared with us some news of virtul world. Suddenly I saw an unusual avatar walked from the side of tea house to us. A 10-year old girl! The first child I see in SL! Her name is Shufei, and a neighbor of Dakini. Shufei Zenith: Thank you, m’am. Shufei Zenith: Is this the usual teahouse meeting? Pia Iger: yes. We are having PaB meeting. Friedrich Ochsenhorn: is it ever usual? 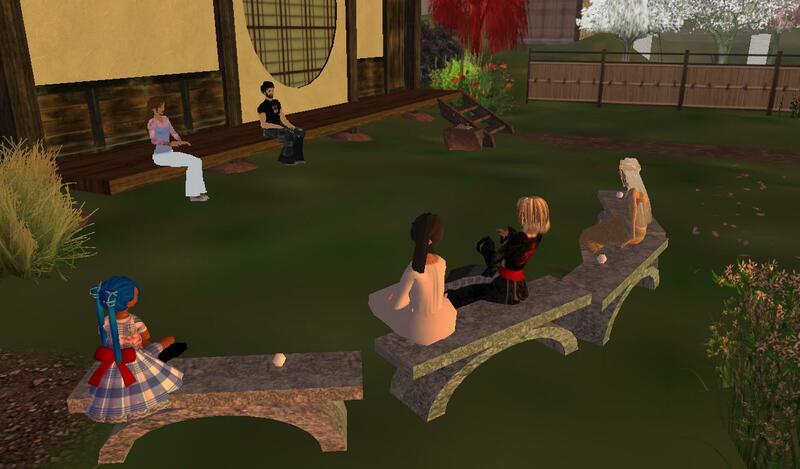 Pia Iger: It’s my first time talking to a kid in SL. Fred has serious questions about our meetings. Friedrich Ochsenhorn: actually, on a serious note, though this exploration is undirected, is there any sense we are going in circles? Perhaps, spirals? Maxine Walden: is that your experience, Fred? Adams Rubble: What do you mean Fred? Friedrich Ochsenhorn: trying to categorize it. perhaps that was my mistake. Maxine Walden: trying to categorize as a mistake? At this time, Shufei’s friend Neela found us. And Fred kept his questioning..
Neela Blaisdale: Hi, yeah I keep getting lost. Do you always run? Maxine Walden: so is spilling overrated! Pia Iger: Oh, Neela and Shufei, we blog our conversation here, do you two mind? Neela Blaisdale: What does that mean do I have to do anything technical? Pia Iger: we just record what we said here and put in a blog online. Pia Iger: Yes. different people. different talks. Steve came and joined us. Fred continued his impression of our PaB meeting and brought up a word that puzzled the rest of us, while Neela was trying to get rid of bothering IM. Shufei Zenith: Howdy Mr. Michinaga. Pia Iger: I do like Frid’s email today, suggesting some structure to our meetings. Pia Iger: For those come here often, it’s easier to talk more deeply. Shufei Zenith: I only read of that fellow… Oh, dear forgot his name… who is buying a route to the sea with you all. Maxine Walden: but you are bringing it up now…maybe you have had more thoughts about that, the subject? Maxine Walden: yes, subject and being? Shufei Zenith: Edit > Preferences > text chat > show chat bubbles. :> Helps me, Ms. Blaisdale. Shufei Zenith: Mr. Ochesenhorn, please clarify what you mean by subject and being and your concern over these in this medium? Shufei Zenith: xixi, ok. Still trying to absorb what you mean by them. Pia Iger: we may use different words. Pia Iger: I think we are exploring Being and reality. Shufei Zenith: Yesh, it’s problematic for me, m’am, which is why I asked. Not sure how to parse it. Maxine Walden: Fred, could you say more? Shufei Zenith listens to the poking of reality and other beasties. Pia Iger: Subject need to be clarified. Shufei Zenith: Sounds vaguely Cartesian. Friedrich Ochsenhorn: seems i managed to create a bit of speedbump. don’t mind me. Pia Iger: This is example of not use uniformed language. Neela Blaisdale: Uniformed or unformed? Shufei Zenith subjects her subjective bubbles to a sheen of soap. Friedrich Ochsenhorn: neela: i’m willing to entertain that, but where does it leave all the other ‘I’s at this meeting? Maxine Walden: which ones do we polish; maybe different ones at different moments, tolerating all our differences? Shufei Zenith: Well, if we shine enough, I hear, we reflect the moon better, and all such ethereal truths. Shufei Zenith: But it means having less subject, so I hear. Friedrich Ochsenhorn: but, if we are talking about the nature of reality here, other ‘I’s might have quite a significant influence. Maxine Walden: I will need to leave in a few minutes (and will take the chatlog ). Shufei Zenith nods to Ms. Walden’s comment. Shufei Zenith: Compassion is an outward, active flow, I suggest. A such, we don’t possess it in any subject’s being. Shufei Zenith: It’s more a “thou” thing. Shufei Zenith: But then again… Maybe we need to be compassionate to our own subjects too. Shufei Zenith gets a headache from her subject. Shufei’s another friend joined us. Then Fred and Maxine departed. Pia Iger: Shufel, can you come more often. We love you! Pia Iger: I was thinking to use “Toodles” tonight! Lovely giggles. And Shufei has something to say about being. Shufei Zenith: You know, Mr. Fred made me think of a professor I had once who taught Paul Tillich. Shufei Zenith: He said that “being” is a verb, and must be regarded consciously as such. Shufei Zenith: People too often call it a noun. Shufei Zenith: It muddles us. Pia Iger: It’s both to me. Shufei Zenith: It’s a dynamic process. Shufei Zenith: Or something else. Pia Iger: that is why I like kids. Shufei Zenith: But really, think on it. Shufei Zenith: People try to site themselves in a thing. Shufei Zenith: A spot, like a lil dollip. But it’s something mutable. Came in Mad Bing and he sat himself on the porch. Mad Bling: what’s the disscussion? Shufei Zenith: subjects and verbs. Shufei Zenith: Yesh, Nothing does. Time to leave for many people…and I chatted a bit more with Shufei. Shufei Zenith: G’bye, ma’am. Nice to meet you, and welcome to Meium anytime. Shufei Zenith: I hope to chat with you again, Ms. Rubble. Pia Iger: Shufei, where do you live? Shufei Zenith: Oh, just over the hill yonder, m’am. Across the moor. Pia Iger: do you have a big house? Shufei Zenith: Shashe and I have a lil temple there. It’s green. Pia Iger: Can I visit some time? Shufei Zenith: It’s Cijian temple. We don’t have this meeting stuff yet, though. Pia Iger: So you came to our meeting before? Shufei Zenith: And I met that fellow once… I forgot his name. Shufei Zenith: Yesh, quite a few neighbors to worry about, I’ve not seen them about. Pia Iger: Pema started the PaB meeting. Dakini lend the teahouse. Shufei Zenith: Oh, I see! How long have you all been meeting? Pia Iger: since april fool day. Shufei Zenith: Wow, only thus? Shufei Zenith: Hehe, everyone comes each time? That’s impressive commitment. Pia Iger: any slot you can make it. Pia Iger: We talk about Being and reality. You look like a right person to join. Shufei Zenith: I would be honored to come now and then, if I’m on.